District town in the government of Suwalki, Russian Poland; built in 1643 under Ladislaus (Wladyslaw) IV., King of Poland (hence its Polish name). While under the Prussian dominion (1808-40) the town was named "Neustadt." It can not be said with certainty when Jews first settled there; it is known that in 1740 a well-organized Jewish community was there. In 1809 the Prussian government offered 1,500 "Reichsthaler" to the person who should build the first stone house in the town: the award was claimed by Isaac Abelson, son of Abba Abelson, then rabbi. The following is a list of the rabbis of Neustadt-Schirwindt: Abba Dayyan (1740-52), ancestor of the families Abelson and Bernstein; Nahum Ḥarif (d. 1820); Löb Brauda; Nathan Stern, commonly called "R. Nathan der Eiserne Kopf," father of Joseph Zechariah Stern, rabbi of Shavli; Elijah Deiches (d. at Jerusalem); Bezaleel ha-Kohen (d. 1868); Samuel Meïr Asch (d. 1885); Israel Ḥayyim Deiches (1885-1900), author of "Imre Yosher" and other works; Ezekiel Wolpa (since 1900). Neustadt-Schirwindt, between 1815 and 1850, contained a number of Talmudists, scholars, and writers, the most distinguished of whom were: Judah Abelson; Isaac Abelson (author of a commentary on the Mishnah entitled "Zikron Yehudah," and who was afterward rabbi in Tzaikishok); Aryeh Löb Blumenthal (Talmudist, grammarian, and mathematician); Kalonymus ha-Kohen (afterward rabbi of Zabludova; author of "Shebet Aḥim"); Dob Bär Goldblum (well-known Hebrew litterateur); Isaac Brauda (grammarian and author); Asher Radin (author of "Ha-Geografia ha-Ḳeṭannah," Königsberg, 1860); Judah Radin; Mordecai Radin. 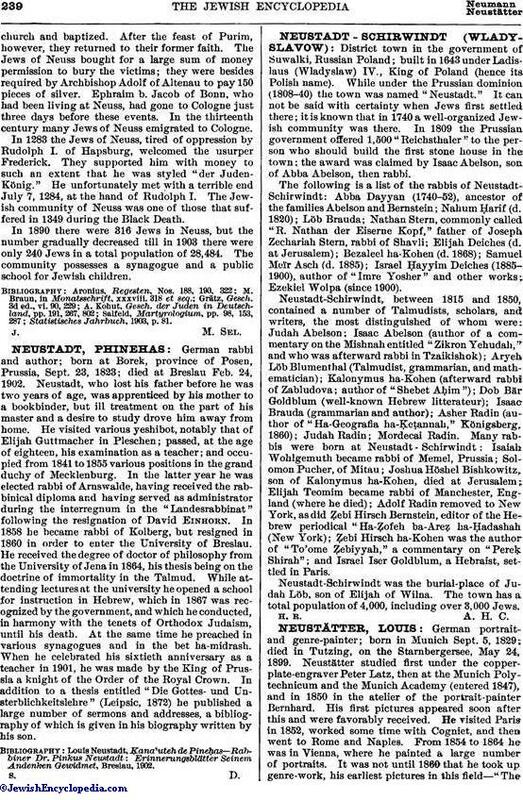 Many rabbis were born at Neustadt-Schirwindt: Isaiah Wohlgemuth became rabbi of Memel, Prussia; Solomon Pucher, of Mitau; Joshua Höshel Bishkowitz, son of Kalonymus ha-Kohen, died at Jerusalem; Elijah Teomim became rabbi of Manchester, England (where he died); Adolf Radin removed to New York, as did Ẓebi Hirsch Bernstein, editor of the Hebrew periodical "Ha-Ẓofeh ba-Areẓ ha-Ḥadashah (New York); Ẓebi Hirsch ha-Kohen was the author of "To'ome Ẓebiyyah," a commentary on "Pereḳ Shirah"; and Israel Iser Goldblum, a Hebraist, settled in Paris. Neustadt-Schirwindt was the burial-place of Judah Löb, son of Elijah of Wilna. The town has a total population of 4,000, including over 3,000 Jews. H. R. A. H. C.